vehicle, and their engines must displace less than 660cc. Besides their tiny size, which matches up well with the size of Japanese streets, kei car owners also get a number of benefits by way of discounts on car tax, insurance, and parking fees. 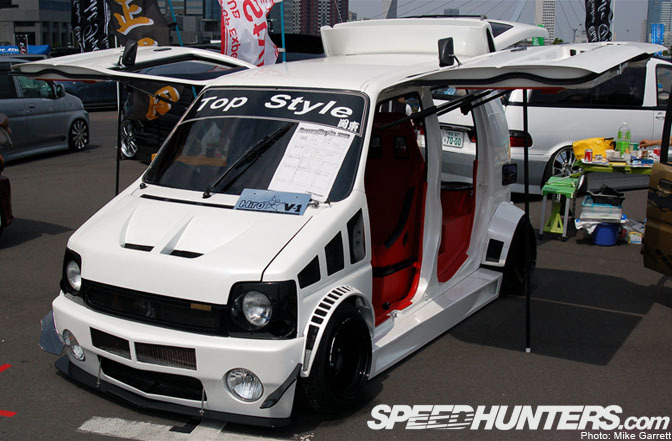 Despite their tiny engines and small sizes, kei car modification is huge in Japan. 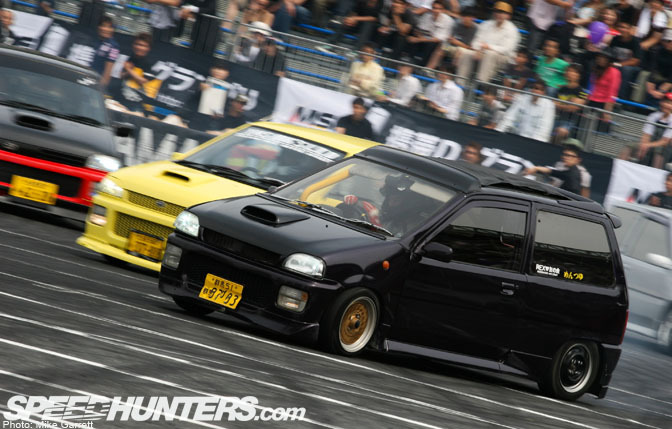 In fact, the variety of kei car tuning is just as diverse as that of full size cars. 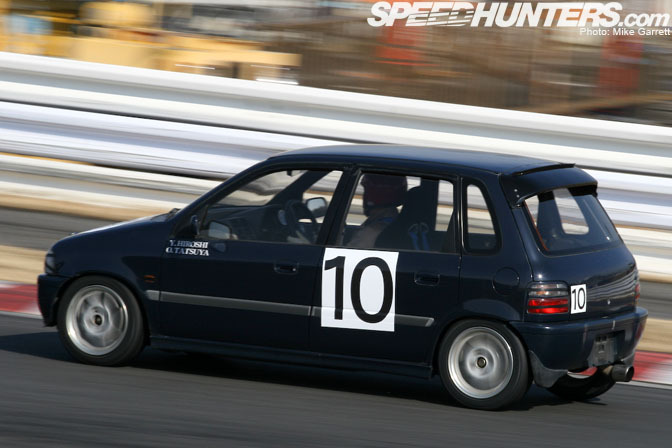 Keis have a place in nearly every part of the Japanese tuning world and I have seen everything from kei time attack cars, to kei VIP cars, and of course the kei drift cars. The predecessors to contemporary kei cars are vehicles like the Honda N360, a model which became popular as some of the first Japanese compact cars back in the 1960's. Although they were primarily designed as simple transportation, they also have a racing following and it's amazing how much power people pull out of the motorcycle-based engines found under the hood of these cars. I took this photo at the 2008 K&K Meeting at Tsukuba Circuit which is a gathering of microcar racing enthusiasts. Many people run kei cars at the circuit, and although they are certainly not the fastest things around, they can still provide a very engaging driving experience when tuned a little. On the smaller, winding courses in particular, their agility can be a big plus. 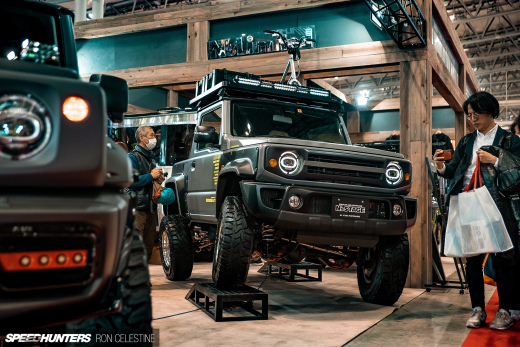 Because of the small displacement of the engines, many kei's come equipped with turbochargers from the factory and that means that easy power can be added with light tuning. Even at low power levels, the small weight of the cars can make them very potent. 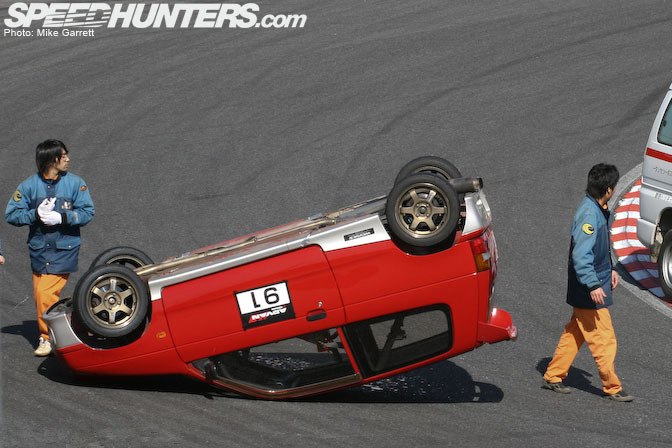 One big drawback of standard kei cars is that they are tall and narrow, which can make the threat of rollovers a big of a problem when racing. This particular car spun entering the corner, just hitting the zeebra zones was enough to flip it over even though it was not going that fast. Something like this would not have happened in a standard car with a wider track and a lower center of gravity. Fortunately the car did not sustain much damage. Then again not all kei cars are tall hatchbacks. There are a few well known "kei sports" machines including the mid-engined Honda Beat which is pictured above. Even though it originally debuted in the early 1990's, This car is still amazing even by today's standards. It is like a miniature version of an NSX combined with an S2000. 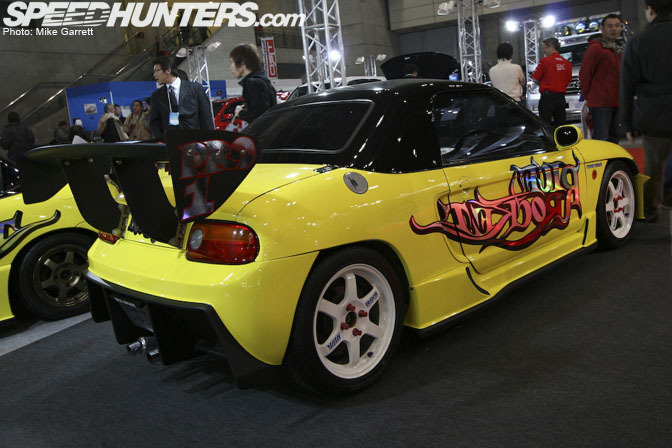 Japanese Honda tuner Backyard Special even shoved an Integra Type R engine into the rear a Honda Beat. Talk about a scary fast car! Another member of the "kei sports wave" of the 1990's is the Suzuki Cappuccino roadster. The Cappuccino has a traditional FR layout and is powered by a turbocharged three cylinder engine. As you can see by the Fighter Engineering Cappuccino in the photo above, the car has a very high potential for tuning. Some prefer to work with the car's stock engine and others have swapped it out for even more powerful engines including the 13B rotary. I haven't seen a ton of modified Honda Beats here, but I have been surprised at the number of tuned Cappuccinos I have seen on both the street and the track. Of course it is not all about racing. The majority of fixed up kei cars are usually modified for looks alone. Kei wagons are often modified in the same style as their VIP sedan and van counterparts. Air suspension, custom interiors, aggressive wheels, big audio systems, its all here. 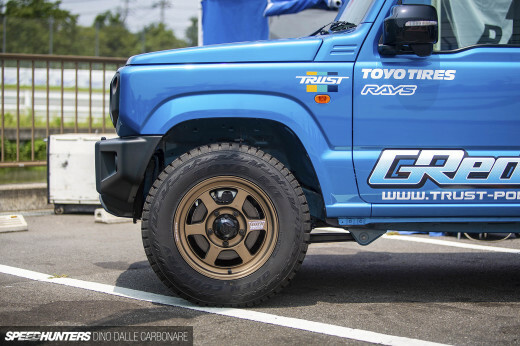 If you go to a Super Autobacs or Up Garage store in Japan, you will see a special section full of custom wheels just for kei cars, usually in incredibly small diameters and narrow widths. Something like this slammed Daihatsu Tanto would be a great daily driver. You can drive it anywhere, carry a lot of stuff, get great gas mileage, and even look stylish while doing it. 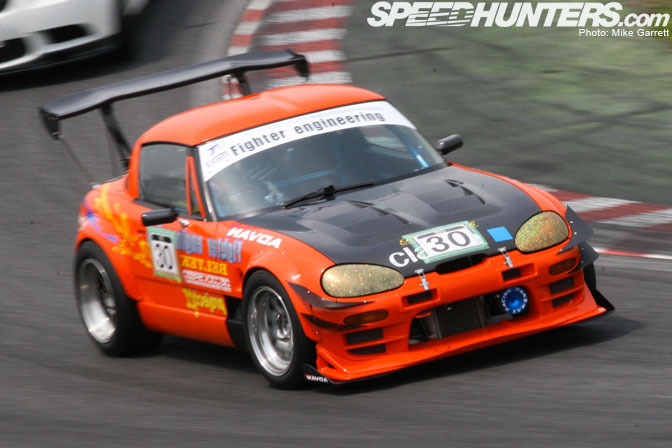 Actually, many drifters and racers in Japan have fixed up kei cars for daily use. 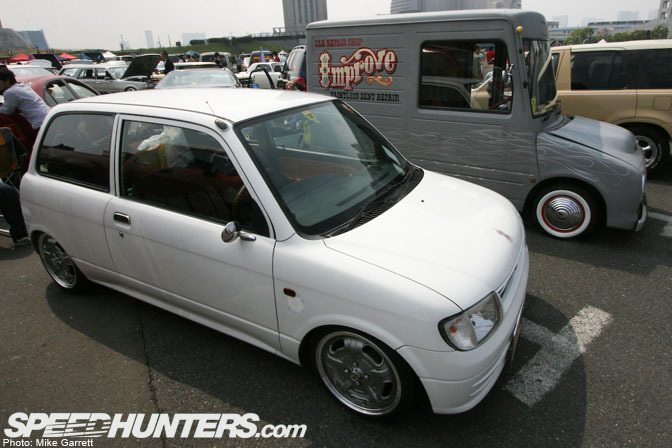 Other kei car owners prefer customizing their cars with a touch of old school American hot rodding style. Mooneyes Japan offers a number of parts and accessories for those people looking to bring some vintage SoCal style to their keis. Also, check out that crazy looking custom delivery truck in the background of this photo! 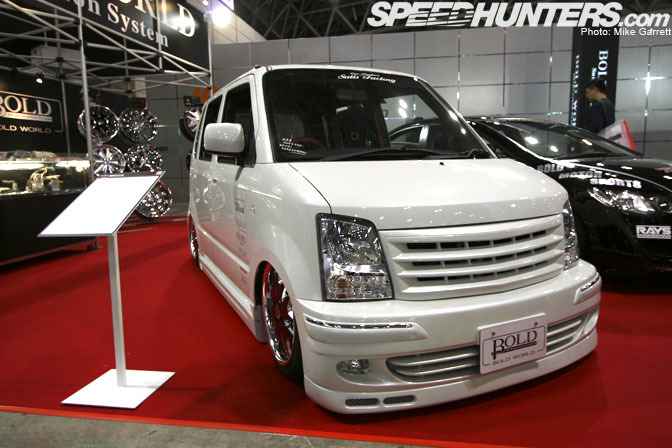 Some kei owners go beyond simple aftermarket parts and have turned their cars into complete custom creations. 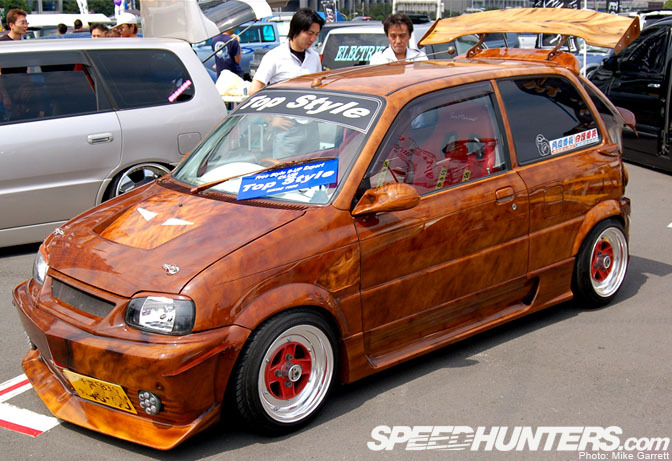 Check out the woodgrain finish and SSR Mk.II's on this car. This car has had a ton of time and work put into it. This car, (which is from the same team as the woodgrain car), has taken things even further. Gullwing doors, custom overfenders, and widened steel wheels with stretched tires. It's so over the top, and I love it. It looks like nearly every part on the outside of this car is one-off. 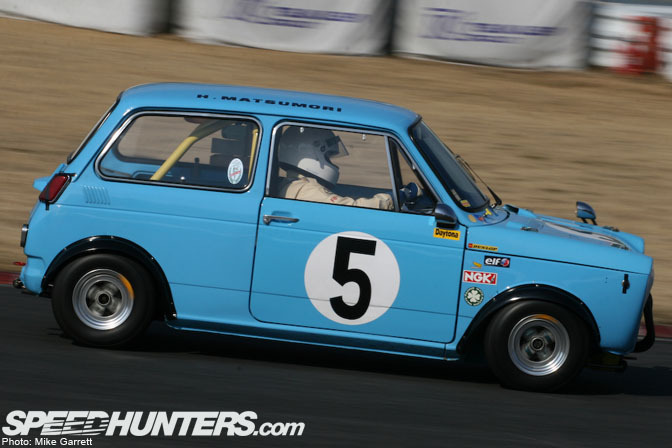 There is also a special band of kei car drifters in Japan. These guys absolutely rip it up and can make their cars do things you would never think are possible. This photo is from the 2008 D1GP Odaiba event where the guys from "Rex Tomo No Kai" were out there performing five-car tandem demo runs in their Subaru Rex's. My most recent exposure to kei drifting came last weekend at the MSC Honjo event. The Daihatsu Mira driven by Mr. Suzuki from Team Always! defeated a bunch of S13's to take the first place in the Middle Class competition. It sure was a sight to see and we will have more on this car coming up soon. As you can see, kei cars are capable of nearly anything when in the right hands, and they are a very important part of the scene in Japan. Hopefully that gives a little overview of Japanese "kei style". The reason the Beat isn't tuned as much as the Cappucino is because the Beat's runs in NA trim, and making much more power out of a NA 3 banger is much more difficult than the Cappucino's turboed motor. I look through a lot of Kei car magazines and the Beat really is rarely tuned, and very costly at that. closest thing we have would be the smart, followed by the honda fit and toyota yaris (vitz), but it would be quite the awesome to see VW Lupo or VW Fox (the current one, the lupo's replacement), or even some of the wilder japanese superminis, rolling around the land. so are these crazy drift keis rwd? its pretty awesome to see all shapes and sizes being used! Hey Mike, cheers for doing a 101 on Kei cars. The ALways! Racing Team is great. They also have nice friends with crazy engine converts. 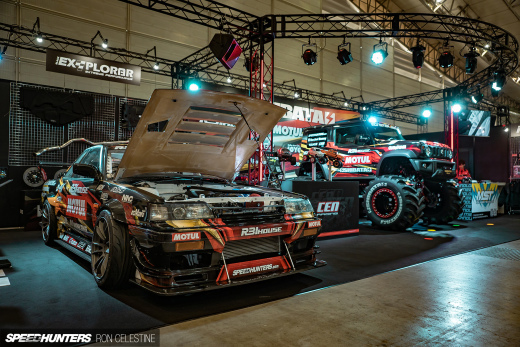 The drifting Mira L700 is a 4wd model which is equipped with a stiff LSD and removed front drive shafts. Mike, could you be so kind and try to make an overview of the typical k-car events in Japan ? I know that there are some k-car oldtimer race events, the K4GP and many more things. I have invented a way to get Kei cars safe enough to pass U.S. collision requirements. Please help me get this idea moving. 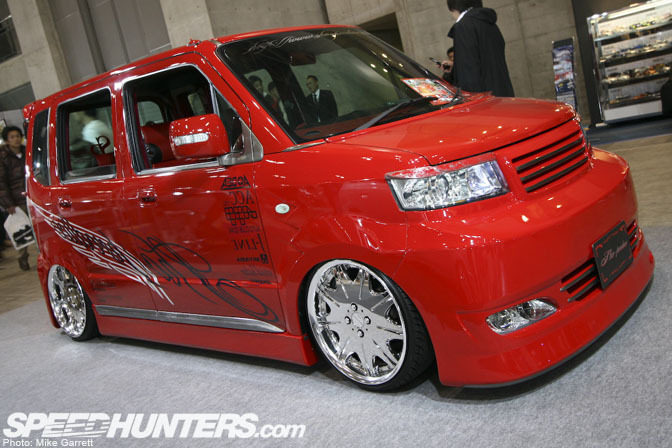 hope you pot more on kei cars tuning. engines and stuff. would really appreciate. i'm trying to gather some info's on k car. i have one mira and thinking of throwing some love on it..